Triple Crown Talk Goes Live! 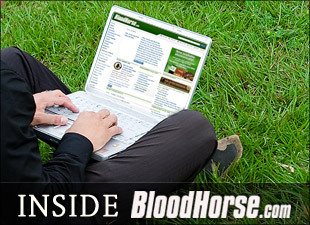 This Saturday, March 7th, BloodHorse.com will host its first ever live blog. Join host Jason Shandler for a live version of his Triple Crown Talk blog from noon to 1 p.m. EDT. In this engaging new chat room-style format, comments will be posted instantaneously as fans ask Jason questions and debate the potential outcomes of upcoming Kentucky Derby prep races. Racing enthusiasts are invited to provide their handicapping tips for the the Gotham Stakes (gr. III) from Aqueduct, as well as Big ‘Cap day from Santa Anita Park. To participate, visit: http://cs.bloodhorse.com/blogs/triplecrowntalk/default.aspx this Saturday at noon. Live blogging is something you're going to start seeing a lot more of on BloodHorse.com. While regular blogging does provide a communication outlet for our readers and editorial personalities, the live chat aspect takes it to an entirely new level. Jason will host a live blog every Saturday from noon to 1 p.m. during the Triple Crown season. On some days he will be joined by notable professional handicappers as live guests to help fans analyze all of the thrilling racing action. If there's a guest you would like to see invited to participate in a future live blog, we want to hear about it. Just use the comment form below to submit your suggestion.